remember these chairs that we inherited? then, remember how those chairs became these chairs? well, now those chairs are these chairs. ones I much prefer (though the real chairs live in storage for another month). this goes so much better with my soft, beach cottage look. Have you been to theletteredcottage.blogspot.com? If you haven't, check it out. You'll love it! Love them! I am so excited that you guys are moving out here! thank you dg darling! you're right! I love your recommendation to the lettered cottage! the stripe is my favorite. Nice job! Darling chairs indeed! Good job! Love your touch Liz. They're beautiful! 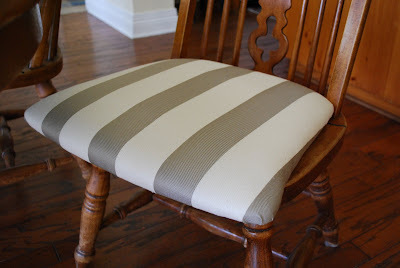 I know this is an old post, but I have been looking for a striped fabric just like this for SO LONG! Can you please tell me where you found this fabric? I'd really appreciate it.